Saturday we drove out to the Brookfield Zoo to meet up with friends for the afternoon. We debated canceling since the weather report included lots of rain, I'm so glad we didn't because it ended up being a perfect day! Cloudy and cool with a nice breeze. We got to the zoo a little after noon and ate lunch and let the kiddos play on one of the playgrounds before walking around the park. It was really fun seeing the babies all starting to interact with each other. There wasn't a whole lot yet but they are definitely growing up. It's amazing to see how different they all are from just a little over a year ago. We were able to see a lot of the different exhibits. Harry really liked looking at the animals. Especially the ones that we could get up close to, like the fish and mole rats. The zoo has a few special attractions you have to pay extra for that sound pretty neat. We didn't do any this year, but I think in a year or two Harry will really enjoy the Dinosaurs Alive and Stingray Bay exhibits- if they're still around. I didn't take a ton of pictures during our visit, but here's a few. HELLO! 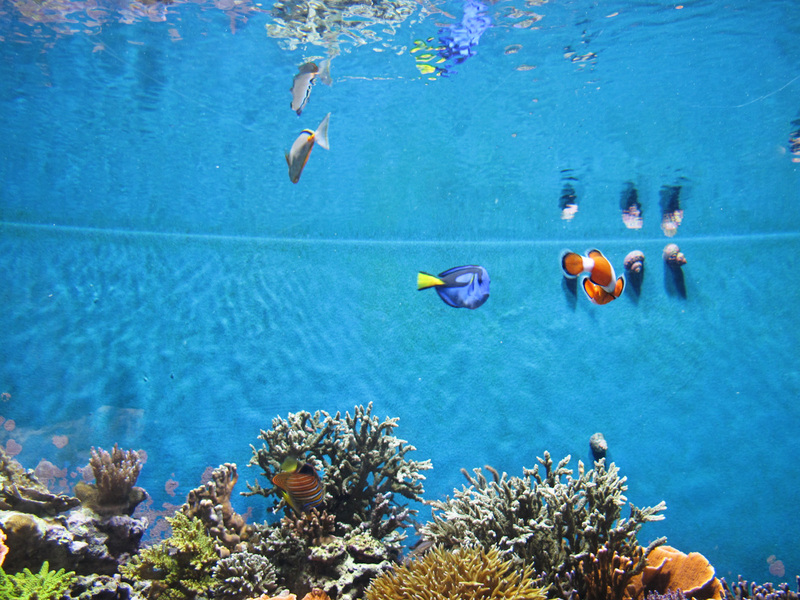 REAL LIFE DORY AND MARLIN!! After meandering around for a few hours Ant really wanted to take Harry on his first amusement ride, the carousel! He loved looking at it go 'round and 'round, so we figured he'd love riding on it. 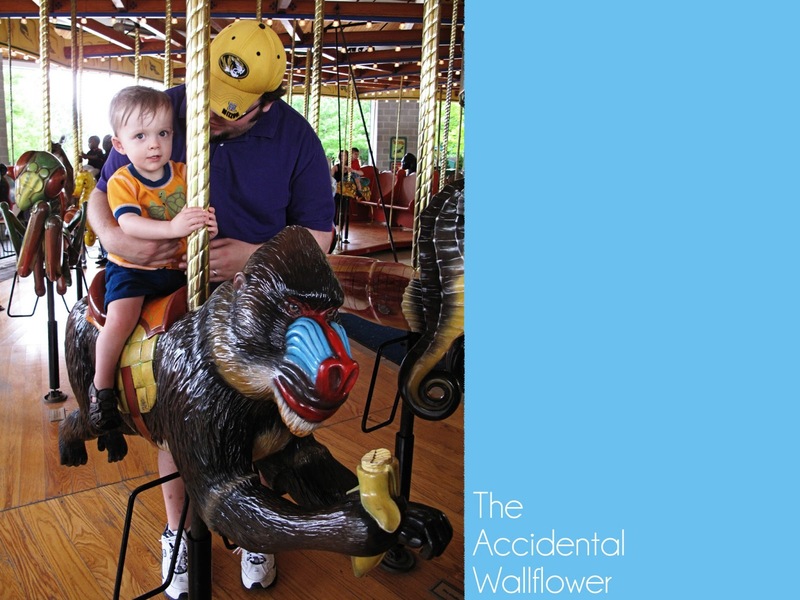 I remember seeing a picture of me as a toddler on a carousel so taking Harry was kind of special to me. We bought our tickets and found a crazy looking Rafiki-type monkey for him to ride on. Looks like fun, right? Harry didn't agree. A split second after I took the above picture he started squirming trying to get off the monkey. We managed to find a seat on one of the stationary benches just as the carousel started. That wasn't any better. He screamed and cried the entire 5 minute ride. I felt so bad but there was nothing we could do until we stopped. After we hopped off we made a bee line for the parking lot- we were clearly done with the zoo for the day. The carousel ride from hell wasn't the worst part of our trip though. I forgot the diapers. Yep, that happened. Before we left I took everything out of my diaper bag to reorganize it. I distinctly remember putting 3 Pampers back in the bag. Yet, somehow they were nowhere to be found when I went to change him at the zoo. Since I so adamantly recalled putting some in my bag I ran through a bunch of scenarios on what happened to them- none of which had me leaving them at home. Luckily Harry didn't pee much at the zoo, he must have sweated out all his liquids that day! Once we were back to the car we found Ant's diaper bag with an extra diaper so before we left I changed him in the trunk- when it of course started raining cats and dogs. We all got soaked, but at least the rain held out until we were leaving. Oh, and when we got home? The diapers were on the counter. Don't know how I missed that one... derp! All in all it was a fun time and I'm glad we're starting to make this an annual get together. I updated the About page yesterday if you're interested in checking it out. Have a great day! And somehow the diaper thing happens. I hate that, we forgot formula a few weeks ago.